Earlier this week we had a customer named Chase bring his immaculate Blaze Metallic 2017 Nissan GT-R for an exhaust install. Chase was looking for something that wouldn't be too loud, and get him the unmistakable GT-R exhaust note that we all know. We came to an agreement that the HKS Legamax Exhaust and Mid Pipe would be a perfect fit. Did we mention that Chase likes big wangs? APR GTC-500 is big enough to satisfy most anyone! But our main focus with this write up is to describe what 2017+ Nissan GT-R owners need to know about their car when it comes time to install a new exhaust. Unlike the 2009-2016 R35s, in 2017 Nissan introduced a new exhaust system with a valvetronic attachment. This device activates an alternate exhaust route in the system for both performance and acoustic improvements. However, when it comes time to install an aftermarket exhaust, if the right measures are not taken, you will be stuck with a check engine light! 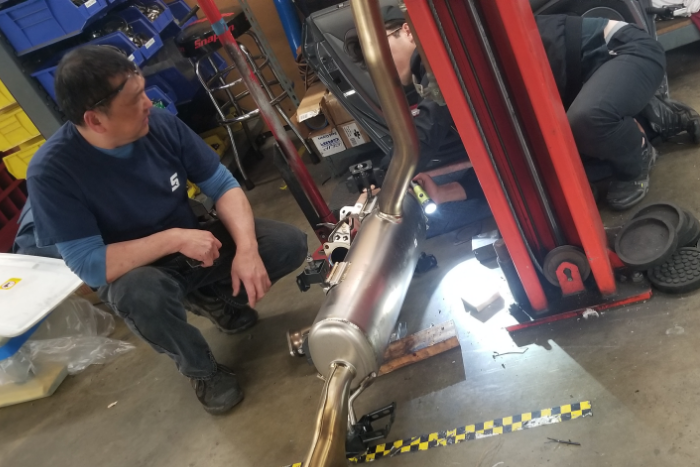 Kristian and Howard taking a look into the exhaust design after removing the valvetronic pipe section on the OEM Exhaust. The valvetronic pipe is on the driver side of the exhaust and must have it's bolts drilled out since they are welded in place from the factory. In total, there are three options that someone can take. Option 1 - Have an aftermarket tuning device such as EcuTek or COBB AccessPort. Option 2 - Purchase an Armytrix Valve Delete Box. Option 3 - Remove the OEM Valvetronic pipe from the OEM exhaust and plug the attached valve motor to its connector to fool the system. *Edit - If using the COBB AccessPort or EcuTek route, you will require a tuner to make the modification to one of the OTS maps in order for the CEL to stay off (if you are not planning on a complete tune). If you purchase a COBB AccessPort through us, we will take care of this for you at no charge. Our poor quality photo we captured during the exhaust install to show where we placed the valvetronic pipe section in order to avoid a CEL on this 2017 GT-R. It is important to note that the removed section of the OEM exhaust CAN be reinstalled to the OEM exhaust in the case that you choose to go back to stock. This is not a permanent modification. We also highly suggest going with the mentioned Option 1 or Option 3 during an install. Our experience in using the Armytrix Valve Delete Box is that it is a headache and time consuming to have the box installed correctly in order to fool the ECU from turning a CEL. Something else we would like to point out is that the rear diffuser on the 2017+ Nissan GT-Rs can cause fitment issues with larger exhausts. Most notably are 102mm exhaust systems. Modification might be required to the rear diffuser to fit these exhausts. We are currently doing R&D to create a new 102mm titanium system for Titek specifically made for 2017+ GTRs. HKS Legamax Exhaust TIps - Perfect contrast with Blaze Metallic! Southern California sun + Blaze Metallic ! We hope anyone in the market for an exhaust on their 2017+ GTR found this post helpful! Keep a look out as we will be producing useful articles like these on a weekly basis from her on. Contact rory@sp-power or david@sp-power if you have any questions!